John Charles Reynolds (June 1, 1935 – April 28, 2013) was an American computer scientist. John Reynolds studied at Purdue University and then earned a PhD in theoretical physics from Harvard University in 1961. 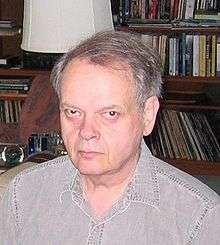 He was Professor of Information science at Syracuse University from 1970 to 1986. From then until his death he was Professor of Computer Science at Carnegie Mellon University. He also held visiting positions at Aarhus University (Denmark), University of Edinburgh, Imperial College London, Microsoft Research (Cambridge) and Queen Mary, University of London (UK). Reynolds's main research interest was in the area of programming language design and associated specification languages, especially concerning formal semantics. He invented the polymorphic lambda calculus (System F) and formulated the property of semantic parametricity; the same calculus was independently discovered by Jean-Yves Girard. He wrote a seminal paper on definitional interpreters, which clarified early work on continuations and introduced the technique of defunctionalization. He applied category theory to programming language semantics. He defined the programming languages Gedanken and Forsythe, known for its use of intersection types. He worked on a separation logic to describe and reason about shared mutable data structures. He had been an editor of journals such as the Communications of the ACM and the Journal of the ACM. In 2001, he was appointed a Fellow of the ACM. He won the ACM SIGPLAN Programming Language Achievement Award in 2003, and the Lovelace Medal from the British Computer Society in 2010. The Craft of Programming, Prentice Hall International, 1981. ISBN 0-13-188862-5. Theories of Programming Languages, Cambridge University Press, 1998. ISBN 0-521-59414-6. "Transformational Systems and the Algebraic Structure of Atomic Formulas" (PDF). Machine Intelligence. Edinburgh University Press. 5: 135–151. 1970. "Towards a Theory of Type Structure". Colloque sur la Programmation. Paris, France. 1974. pp. 408–425. doi:10.1007/3-540-06859-7_148. "Types, Abstraction and Parametric Polymorphism" (PDF). Information Processing '83. 1983. pp. 513–523. ↑ Fisher, Larry (29 April 2013). "John Reynolds, 1935 – 2013". Communications of the ACM: ACM News]. USA: Association for Computing Machinery. Retrieved 30 April 2013.